The Gym 01 & University of Portsmouth ahead of the King of the Ring tournament. James Connor spoke of his pride after his Gym 01 & University of Portsmouth charges lit up the international stage for a second successive year. The students again flexed their muscle in the King of the Ring tournament in in Boras, Sweden. They returned with two gold medals and two silvers. Meanwhile, Cormac Garvey and Tomasz Guss just fell short and finished as runners-up. Last year the university squad picked up six medals in total. Connor knew the competition was going to be much tougher this time around, however. And the head coach was delighted with the performances his amateurs delivered. He said: ‘I was really impressed with our boxers in Sweden. ‘They really stepped up in the face of daunting competition and gruelling fight schedules. ‘We won six medals last year but I wasn't expecting as many this time as I knew it would be much harder. ‘To be honest, if we’d have won two I’d have been happy so I’m delighted with four considering the opposition. But he relished the challenge and was crowned 64kg class B champion after two impressive victories. The captain took his sterling record to 15-1 and is set to earn a call-up to the Gambia national squad. Aujla also ran out a decisive winner in the 81kg class C category following three fine displays. Connor said: 'Omar recorded two dominant unanimous-decision performances, improving his record to 15-1. ‘That is unbelievable at amateur level. If you're better than 50/50 then that's an achievement. ‘To lose once is almost unheard of. ‘He knew the Gambia team were watching him and they are really excited about him. ‘I believe he can box and elite and international level. 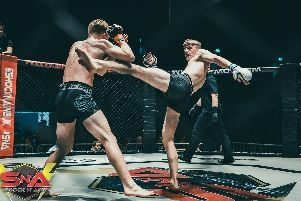 ‘Taren was quite disappointed he didn’t stop his opponent in his second fight after picking up a first-round finish in his opening bout. ‘However, that’s how you learn. If you continue to knock opponents out in the first round then you're eventually going to be found out and outboxed. Garvey took silver in the 64kg class C band following a decision defeat in the final. Fifteen-year-old Guss also just missed out on gold in the 66kg junior class B category following two tough bouts beforehand. Regardless, Connor reckons the pair performed admirably and saluted their efforts. The head coach added: ‘Cormac boxed an absolute war to get through to the final. ‘He gave several standing counts to his opponents on the way, but unfortunately just fell short. ‘After losing both bouts this season before the trip, Tomasz stepped up massively. ‘He smashed his way to the final by dropping one opponent with a body shot. ‘But he was very tired and after two hard bouts, he struggled in a competitive final.